Apparently alarmed by the spate of hate speeches and threat from northern youths to South Easterners to vacate the north before October 1, members of the National Peace Committee today met in Abuja to find ways of mitigating the tension in the land. 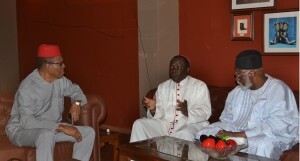 The meeting, which is coordinated under the auspices of the Kukah Centre, was conducted by its Chairman and former Head of State, General AbdulSalam Abubakar and attended by the Sultan of Sokoto, Saad Abubakar 11, Cardinal John Onaiyekan, former Chief of General Staff,Commodore Ebitu Ukiwe, Bishop Matthew Kukah and Vanguard Publisher and Chairman, Sam Amuka, among others. The meeting, which has the support of the United Nations Development Programme, UNDP, is aimed at proffering solutions to the myriads of agitations being thrown up by tribal and religious groups in the country. Although the meeting was held behind closed doors, Vanguard learnt that it deliberated on how to fashion a national peace policy for the country and the end the security challenges in various parts of the country. Among the key areas of interest to the meeting, which was held at Sheraton Hotels and Towers, Abuja, were the Biafran agitation and the quit notice to the Igbo by Arewa youths, farmers-herdsmen clashes, Southern Kaduna conflict and a general discussion on the state of the nation. The meeting also reviewed insights by civil society groups on how to strengthen peace and security and deliberated on the way forward for a Nigeria in the short, medium and long term basis. It will be recalled the the peace committee last week issued a statement blaming failed politicians for heating up the polity after failing to deliver on their mandate to the people who elected them into various offices in the land.